Starting a marketing campaign to green your club, gym or spa? Already got rid of the bottled water for reusable bottles and water stations? Already moved gym apparel to more eco-friendly alternatives? Already given out a few shower timers to remind folks to save water? Now let’s talk about what Norwood can do for your gym bags. In 2011 Norwood is releasing a number of new recycled content totes as part of their goingreen line (all lowercase) to include the A Step Ahead Messenger and Center Court Duffel, two bags that I think will work great for gym promotions. Neither is exactly large (for that I suggest the traditional Kodiak Eclipse Large Duffel), but both have more of that urban design that seems to appeal to the 20 and 30 somethings that tend to be the main target for gym recruitment. The AP3200ECO A Step Ahead Messenger is the more basic of the two options, but also likely to appeal to the most folks as messenger style bags work well in lots of different applications, from the gym, to office, to travel bag. 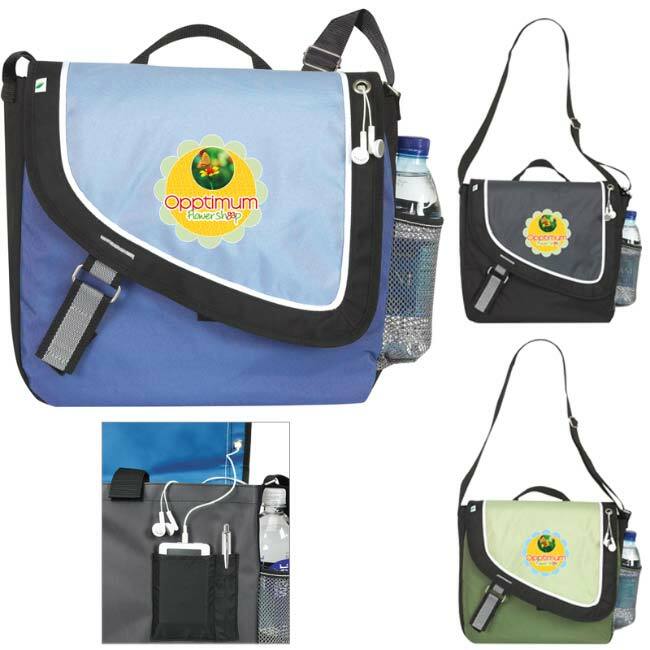 The A Step Ahead Messenger features a velcro closure on front flap and main compartment, a must have organizer panel and headphone port (great for all those iPods), a mesh water bottle pocket to hold the water bottles you already handed out, and an adjustable shoulder strap. As a Norwood goingreen item the A Step Ahead Messenger also features the goingreen leaf label and informational hangtag, which explains that the body fabric of this product is made from 45% post-consumer material. The bag is also available with full four-color process imprinting and part of Norwood 24hr service program, so a great go-to item in a time crunch. The AP6810ECO Center Court Duffel is a larger bag – 18″w x 10-1/2″h x 9″d vs. the 13-1/2″w x 12-1/4″h x 3-1/4″d of the messenger – but comes in the same 45% Recycled PET material as the messenger and also the same Grass, Onyx, and Rain color options. This makes the two bags great companion pieces for any give-away event. Sign up for a year get the messenger, three years and the duffel is all yours, but from a marketing point of view the same artwork, layout, etc., will work on both units, which helps with that all important brand consistency. The Center Court Duffel features the same leaf label and hang-tag as the A Step Ahead Messenger. Other attributes are a zippered main compartment, full front slip pocket for that water bottle, and an easy to adjust shoulder strap with fabric wrapped carrying handles. Both the terms eco-friendly and heathclub have a good for you impression with the general public, regardless if they are making it to the gym each morning or sorting their paper and plastic curb side. 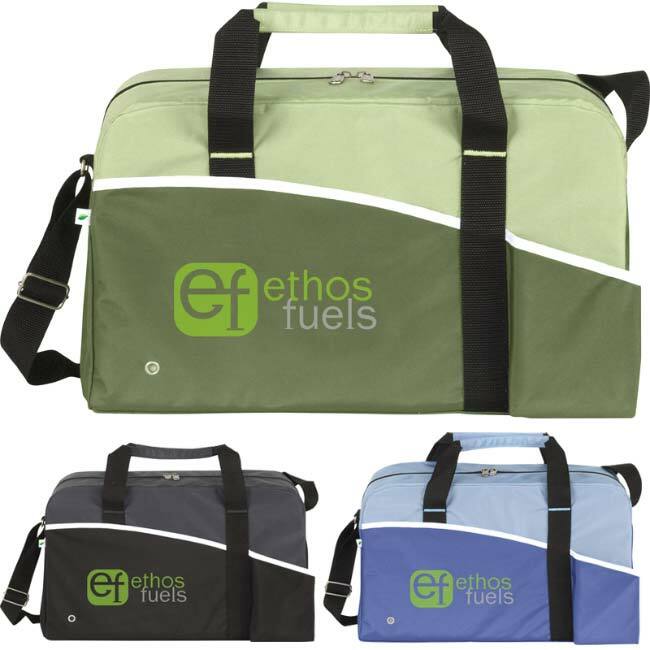 For those marketing to the same public, eco-friendly options like the A Step Ahead Messenger and the Center Court Duffel are a nice way to bring those ideas together, good for the planet, good for the person, and hopefully great for your marketing efforts. If you are an ASI distributor D’Anna Zimmer is the contact to talk to at Norwood about their full line of totes. If you are interested in these bags to promote your own business, contact your local promotional items vendor or email info@proformagreen.com for information, pricing, and samples.